Dr Natalie Kemp CPsychol, is an active member of the HOP-MHP stakeholder group. She identifies as a clinical psychologist in recovery from mental ill health. In October 2017, she set up the online peer support group in2gr8mentalhealth, which provides a space for different mental health professionals with lived experience to come together and share and explore their ‘dual identity’. In early April, the group had its first face to face peer group meeting and on April 27th this group celebrated its first 6 months. The community now has over 180 members and in May is holding its first public talk, which is taking place in Liverpool. What inspired you to start in2gr8mh? 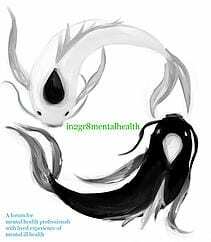 Its creation is indivisible from my experience of breaking down as a mental health professional in service. It was inspired by everything that wasn’t there: an absent guiding professional body; an emotional health service blind to the emotional health of its own team; Human Resources and Occupational Health processes uninformed about collaborative psychological formulation to find meaningful ways of working during mental health difficulty; stigma conflating competence and capacity, when being clear about capacity is competence; provider mental health stigma telling you you lose all rights to being a psychologist if you’ve needed support to contain things that have happened to you – how could you ever contain anyone else? I tried to pull on energies I didn’t have to challenge the gaps and stand by a searing psychological pain that was coming up for healing, but it was too much. I felt professional devastation, systemic negligence in a field that should know better, and fractured from any peer group. I sank into becoming unwell clutching onto these experiences knowing that if I could come back, I would do so to question all of it. in2gr8mentalhealth was born. What have been the best moments to date? Every time someone joins this beginning community and finds it a place that validates all of what they bring to the work. That they stick with such an organic development as we find our feet, is a wonder. I’m grateful every day! Questioning health organisations, regulators and professions about how they understand humanity. Being both a professional and having lived experience of mental ill health confuses system divides; yes it undermines ‘othering’ which is good, but it also undermines projective defences of one into the other, which will annoy. But without working through systemic defences, we are left back where we started, perpetrating splits and divides externally and internally. What do you hope for the future, for in2gr8mh and more broadly? That it shouldn’t need to exist. in2gr8mentalhealth stands for the change that needs to happen so those who move between either chair in the therapy room, or staff and service user roster onwards, can own all of their experiences as valid to working in the mental health professions, and breaking down can be understood as times of intense personal learning, growth and wisdom which have an awful lot to offer. If mental health services can find psychologically informed ways to integrate the natural ebb and flow of human capacity to work depending on what happens to us in life, without feeling it a threat to its primary task of providing a service, it will enhance its ability to de-shame, contain and increase mental health amongst both service users and service providers (whichever we are at the time). The system seems confused, it promotes the gifts of lived experience in one type of role such as the valuable work of peer support, but engenders silence and fear in others – why? It’s called in2gr8mentalhealth because great mental health comes from the ability to in2gr8 all parts of our experience into how we understand ourselves. This integration is what I hope for in my personal recovery work, and what I hope for in mental health systems.